Saltwater fish are beautiful and exotic. It’s only natural to want to fill your custom tank with as many of these gorgeous creatures as possible. But how do you know if an expensive saltwater fish is worth its price? Sadly, there are fish vendors out there who will try to scam you with less than stellar livestock. Still, you can take precautions to protect yourself from buying a sub-par saltwater fish in Crystal Lake, IL. In this article, we will help you through the process of purchasing saltwater fish. Along the way, we will give you tips on how to avoid buying a fish you’ll regret. So, let’s get started! How Do You Know if a Saltwater Fish Vendor is Trustworthy? Use the Internet to look up the seller you are considering on social media, Yelp, and other websites. You should pay particular attention to the reviews left by previous customers because those will be a good indicator of the seller’s trustworthiness. If you find a bunch of tepid or negative reviews, then the retailer is probably not worth your time. You should also look to see if any of your connections on social media have bought from this place. If so, reach out to those connections and ask them about their experience. Hearing an honest take from a person you trust is one of the best ways to determine if a fish seller is legitimate. Once you’ve done your preliminary research on the vendor, the next step is to have a conversation with them. Gauge their knowledge of fish. Do they seem to know their stuff, or do they rub you the wrong way? If your gut is telling you that this doesn’t sound like the most reputable dealer, then they probably aren’t. You should also be wary of retailers trying to push the merchandise on you. No honest fish seller is a pushy salesperson. The best vendors are more interested in the welfare of the saltwater fish than making money. So, if you feel like they’re just after your money, then they probably don't deserve your business. How Do You Avoid Overpaying for Saltwater Fish? A decent price range for saltwater fish is anywhere between $10-$100. However, you could go beyond that range if you know you’re dealing with a quality vendor and the fish is in exceptional shape. Most big box pet stores are not high-quality places to buy fish. Therefore, you should be especially cautious with your money when buying fish from them. 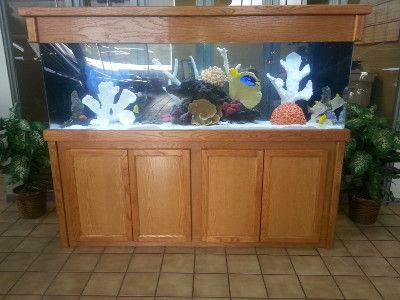 Another way to keep from overpaying is to only buy from fish stores that offer warranties. If a seller is willing to stand behind their fish for at least a week, then they probably have good merchandise. It’s also nice to know that if your fish dies during the warranty period, you can get your money back. How Can You Tell if a Saltwater Fish is Healthy? A beautiful aquarium starts with healthy saltwater fish. Once again, Internet research comes in handy here. By watching videos featuring the saltwater fish you’re hoping to buy, you can get an idea of how it behaves when it's healthy. Pay close attention to how it looks, breathes, and swims when at full strength. Then compare what you see in the video to what you see in the store. The eyes are usually the best indicator of a fish’s health. If they are cloudy or have specks in them, then you probably have a sick fish on your hands. A fish may look good, but if it doesn't eat, then it won’t last long. Therefore, you should always have a fish seller feed the fish in front of you to make sure it will eat. This way you’ll know you’ll be able to keep it alive. A fish may appear healthy; however, if other fish in the tank are sick, then that’s a bad sign. Chances are it’s only a matter of time before that healthy-looking fish gets sick as well. So always be sure to examine the companions of a saltwater fish before making a purchase. 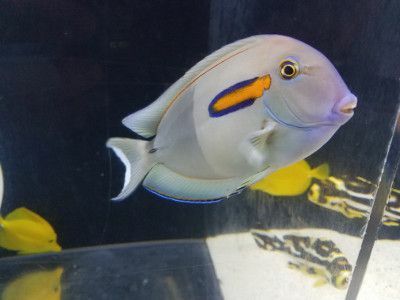 Did you find our tips for buying saltwater fish helpful? Feel free to share this post on social media using the super-easy share buttons below! What Do You Feed Your Freshwater and Saltwater Fish?